Are you committed to making your next Project a successful base for a Project Management career? A Deep-dive into Project Management Skills for Serious Students and Practitioners. In-depth Project Management training program, so you can tackle your next project confidently. Clear, simple explanations of all the key ideas, so you can learn quickly and easily. The basis for a big career shift, to give you new opportunities, new roles, new responsibilities, and a better salary. But you feel like no-one has really understood your potential as a Project Manager? ... and now, every day that passes, you feel like you are missing more opportunities? ... and now you feel like you are fighting to take control of the one Project that could be vital to your career? Or you need to improve the way you deliver your Projects to get more of them on schedule, on budget, and to the delight of your sponsors? ... and you feel like you are being judged unfairly. You need training, tools, and ideas: not reminders and criticism? But you don't have all the skills you need to get you properly started. I see this a lot. But can your organization give you the training you need? ... and will they make it available to you, even if they can? Your training will be easy to understand and highly practical, so you can demonstrate you understanding easily, apply your knowledge effectively, and get results quickly. Our online training is easy to use. You can access it where and when you want it. You just need a browser, and you can start today. You will get instant 'aha moments' and ready-to-use tools and templates, today. This means you can deliver real-world Project results tomorrow. No travel, no lost work, no hotel fees, no subsistence. No other materials to buy. It's all here in one package. Pay once: access for life. So how would you feel to be on the inside of Project Management? "My Immersion Program will take you well beyond the fundamentals. for a fifth of the price of my four day live training"
How will you feel when you are able to deploy all the right tools at the right time? You'll see positive results almost immediately, as you apply what you are learning. You'll rapidly gain control over your Project and start planning effectively and delivering to schedule. And if you have questions, you can just ask me - there is interactive Q&A built into all of our programs. So you can get clarification about what you are learning, and advice on how you can implement it on your projects. "﻿I know this training well﻿. I have made a great living doing it. But it can't reach enough people." You had to wait until HR commissioned a Project ﻿M﻿anagement course. Or you had to travel a long way to attend a public course. You had to give up one, two, or more days to do the course, getting way behind on your work. And you had to take notes so you could remember everything in a month's time. "﻿﻿﻿This is the future: convenient, economical, and effective. it works for organizations, and it works for ﻿﻿﻿you﻿﻿﻿﻿." You can get the training that you need, today. You can take modules when and where you want. You can fit your courses around your work, your family, and your social life. And you can repeat any part of the course, when you need it, and as often as you like. I spent twelve years as a full time Project Manager at Deloitte Consulting. While I was there, I led teams of between 3 and 80 consultants, delivering complex change projects for multinational, large national, and Governmental clients in the UK and Europe. But I wasn't always a successful Project Manager. For two years, I was constantly chasing that first opportunity. All my boss would say is 'you can't manage a project, until you get some training.' But there was no training. So I couldn't make progress or demonstrate my ability. That's why basic Project Management skills training is so important to me. I built two training businesses and have delivered live training to several thousand project managers, becoming a much in-demand trainer and speaker. My seminars frequently have audiences of 100 or more. But with live training, I can only reach a small number of people. I want to make my training available to more people. And especially to those who, like you, may not have access to live training. Your organization may not be able to, or choose to, commission it. Your bosses may not put you forward. You don't have the time. I wanted to create easy to use, low cost, Project Management training that will give you rapid results. I have written 13 print books for publishers like Pearson, Wiley and Macmillan. These include best-sellers like How to Manage a Great Project, Brilliant Project Leader, and Powerhouse, along with specialised Project Management titles like Risk Happens! and The Influence Agenda (about stakeholder engagement). “One of the best seminars I’ve attended in the last 17 years. Enjoyable practical and useful. Anytime, anywhere convenience, so you can learn when, where, and how you want to. Training written and delivered by an experience Project Manager AND Trainer with nearly 20 years of training Project Managers, so you get reliable, pragmatic knowledge. Learn easily and rapidly, so you can make a difference and get results right away. Solid knowledge and robust tools, so you can be seen as an effective and highly professional Project Manager. This course will open up real career options for you: new opportunities, new roles, new responsibilities, and the chance of a better salary. You aren't ready, it's too hard, there won't be any opportunities, or you need a live learning program to get started. Nonsense: If you want it. If you need it. Go and get it. Trying to cobble together your Project Management training on the cheap. Don't get me wrong, there is a lot of good stuff on the web, for free. There is a lot on our website. But too many people try to build a YouTube syllabus and get themselves totally confused and misled by conflicting advice, mismatched terminology, inconsistent approaches, and downright awful content. Reality: If you want quality, you need to pay for it. The Time-Cost-Quality triangle is one of the core Project Management concepts (the module: Triple Constraint). If you want quality, and speed, you need to pay. If you want it cheap, you'll need to sacrifice either speed or quality... or both. Efficiency: Why waste your precious time figuring out detailed processes, creating useful tools, and learning valuable tips for yourself, when you can tap into many years of training, learning and experience. This is right for you if you are serious about succeeding in your first significant Project . You can access your training on desktops, laptops, tablets, smart-phones, and web TV. Watch, listen, or read in your office, workplace, home, cafe, bus, or train. All of this will be available to you 24 x 7 - including midnight over the holidays! But note: the Q&A is not outsourced to some Fiverr pay-by-hour service. It's me: Dr Mike Clayton. So there may be some delays to Q&A reponses over the holiday periods! ...and our 30-day, no questions asked, 100% money-back guarantee. Live training costs from $250 - $750 per day. This program is the equivalent of four-days' classroom training - 16 hours of video Project management education: $1,000-3,000. A project coach or mentor will charge you from $150 to $700 per hour. Book me for a day in the UK for up to $3,000. Yes, my clients do pay that. ...and what is the true cost of discovering all of this material by piecing together YouTube videos, blog posts and articles online, with conflicting terminology, different systems, and variable reliability? Well, actually, I don't believe you could piece together all of this content! Payment Plan also available on full price. Or sign up for a monthly subscription for just $40 / £27 per month. Enrol now and start your journey to become the professional Project Manager you know you can be. Enroll Now and Get Started! or Subscribe monthly & Get Started! If you are not completely satisfied with your course, you can claim your full purchase price back. Do the whole course, put it into practice, and ask questions. If you don't get what you need... Just ask for your money back. If you buy and enjoy any of our courses and later want to extend your learning, you will always be able to upgrade to a higher tier, with the full price you paid for your current tier discounted from the current price of the higher tier program. "This isn't just a consumer protection guarantee. You have that. This is my personal guarantee. I am building a business to last, and I'd rather give you back your money if my courses don't meet your expectations, than have you unhappy in any way." Well, we'll ask, because we'd truly like to know why you aren't happy with the Project Manager's Immersion Program. But, no answer required; just requested. 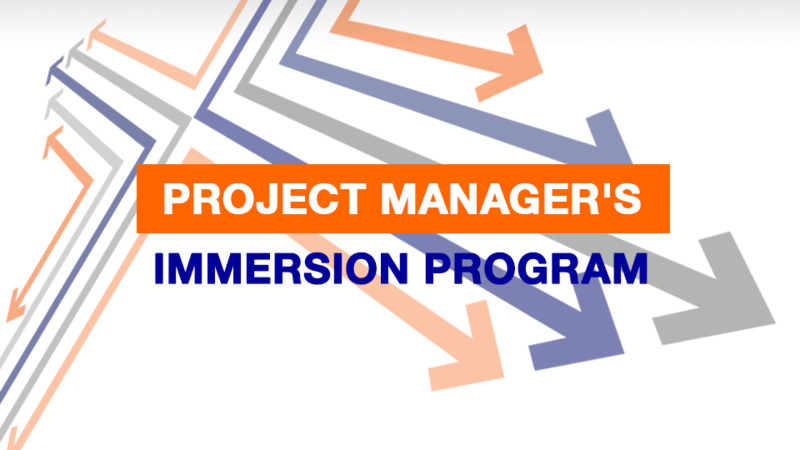 The Project Manager's Immersion Program will boost your project career. It will give you the confidence to take control of your projects, and teach you the skills and techniques to deliver your projects to schedule, on budget, and to the delight of your customers, and the pleasure of your bosses. And it would be foolish to wait. As a Project Manager, you know that making progress and getting things done is paramount. There is no risk to you in taking action now. Our 100% 30-day Money-back Guarantee will see to that. So all your risk is in delaying. If you want reliable, pragmatic knowledge that will get you results right away, enrol now. ​Seriously, you get all that summarised into a structured program that I have written to be punchy and deliver almost pure content. Totally practical - you can take my pragmatic tools and processes and apply them to your project, Today! That's what OnlinePMCourses is here for. We'll be developing more training, including long and short video programs to meet every learning need for someone like you, who plans to build a successful project management career. We would never want you to be unhappy! If you are unsatisfied with your purchase, contact us or Teachable in the first 30 days and we will give you a full refund. You can always use our ﻿contact form to get in touch. How long do I have, to access my course? After enrolling, you have unlimited access to this course for as long as you like - across any and all devices you own - whenever you want it. How does monthly subscription differ? Just one difference. You won't be able to download and store the videos. Your payment will go through industry leading video training platform, Teachable. And you will get Teachable's 30-day money-back guarantee. And don't forget... in most countries, Pay Pal and your credit card issuer offer additional consumer protection. What format will the downloads be in? All of your downloads will be in standard formats, a mixture of PDF, DOC, MP3, XLS and PPT formats. Can I see what the course videos are like? Just click your way over to our Sample Project Management Videos page, and you can see seven of the videos from our core course programs​. When will my course start and finish? That's fine. Just email us or use our contact form to get in touch.